I stumbled upon a video online about someone designing a complete cell for a machine tending application. Recognition of number of parts. Use existing trays to present parts. It should not matter how parts are placed in the tray when presented to the loading system. It should not matter whether a part is turned 180 degrees when presented to the loading system. Automatically de-stack and re-stack trays when necessary. The challenge is on and I'll post a video on how the Robotiq team did it later on! 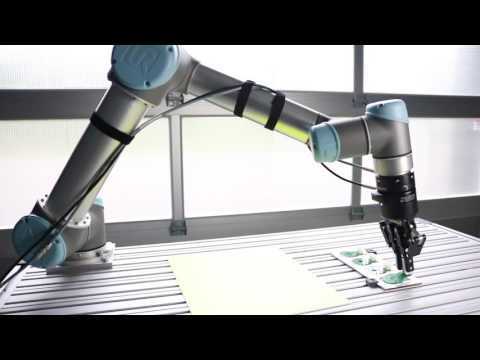 We have some very similar applications running currently and they both use robotiq 2F85 grippers, one with highly modified fingers and the other running the standard finger tips. We probe the tray in each application slightly differently. We use the force feedback of the robot in the first application to find the top of the part, we know if there is no part in a particular pocket if the robot never sees the right force. The reason we did this is the customer can run parts with varying heights and this allows us to determine the actual height of the part that is currently loaded so we can use that later when loading the machine. The other we use the object detection of the gripper and determine where there are parts. On the machine with the modified fingers, we do not pick up the tray but rather push the tray out of the work cell when we have exhausted all of the parts and notify the operator via a push notification to their phone that the tray is empty. They are also able to monitor the status of the tray that is currently running from anywhere in the world using our app. A full load of parts allows the CNC to run for about 10 hours unattended. On the other one originally we were going to move trays between operations and so we 3D printed an adapter that allows the gripper to securely lock onto the tray and relocate it to the discharge side. The customer had us change this and we now just put the finished part back onto the same tray that the raw part was on. When the robot is finished with the tray he notifies the operators that he needs more parts and they simply come refill it. The total processing time on this robot is about 28 minutes to run the parts and 2 minutes to change out the tray with new parts which includes an inspection of the parts that were just finished. I would also consider partial closing of the gripper above the part when it is picking it up in the tray. The opening would be slightly larger than the pick position on the part. Then I would move the robot such that the part rest against two sides in his tray pocket. Then fully closing the gripper to pick. This would require maybe some custom fingertips but would also remove the hooks on the tool that lift the tray sideways.